CLINTON, N.J. (WPVI) -- A life-size Ronald McDonald statue stolen from a McDonald's in New Jersey last month has been found. But authorities are keeping mum about where it was found and who took it. 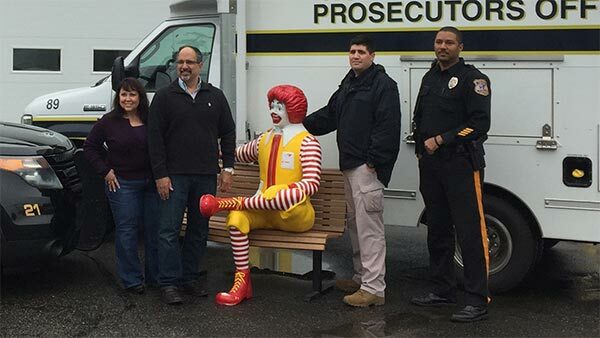 Hunterdon County prosecutors say the 250-pound fiberglass statue of the clown character sitting on a bench was taken from the McDonald's in Clinton. They announced Friday that it had been found but declined further comment. The couple that own the restaurant say the statue wasn't damaged. They plan to move it to a secure location and will have it refurbished and repainted as part of ongoing restaurant renovations. A $500 reward had been offered for information on the theft.